i have a good reason for the hiatus. I am a very busy woman, you see. Busy planning the first ever…..
F A L L E A R T H F E S T I V A L !!! The festival is being held in honor of National Campus Sustainability Day (say that five times fast). Activities are planned for both campuses. At Lawrenceville, NCSD multi-media events (code for the above) will be taking place in the SRC from 10-2. NCSD will be celebrated at Westminster on the Great Plains from 10-4 in the form of an old-fashioned country fair with an eco-minded twist. Each game will test your green knowledge as well as your carnival skills (don’t worry, no tight rope walking while balancing plates on your head and singing opera–I’m pushing that for next year). There will be food and merriment, accompanied by a focus on responsibility to our local community and our planet. producer of the world’s first products made from and packaged in waste. you won’t want to miss this guy. promise. if just 2% of the U.S. population turned on the bathroom faucets to a fraction of full blast when washing their hands, nearly 12 MILLION GALLONS of water could be saved every day. Ladies and gentlemen, Dr. Michael Gray (or The Legend, as he’s known in some circles) has moved on to bigger and better things. Friday, August 8, 2008, (holy commas batman! ), was Mike Gray’s last day as an employee of Rider University. Mike decided it was time to pull up the stakes and move out to charming O-hi-o to pursue an MFA in Film at Ohio University. “It’s what I love,” said Gray (actually, he didn’t say this, but I know it’s true). Note: I did not force Mike to write that last sentence. That was genuine (and greatly appreciated). We’ll miss you, Mike. 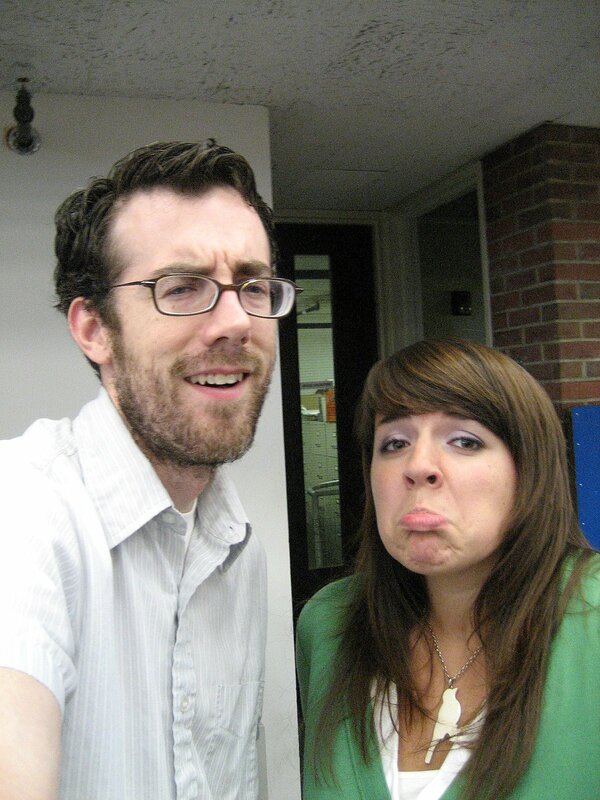 We’ll miss your creativity, your follow-through, your quirky sense of humor…and the way you used to read Hokey’s voice out loud when we were creating the comics. Best of luck to you, friend. if you haven’t already, look at thedailygreen‘s latest update on 10 of the Greenest Colleges in America. It’s interesting to compare and contrast what other campuses are doing to reduce their carbon footprint. It also brings to light the amount of time and effort required to reach carbon neutrality. In 2007 College of the Atlantic was the first U.S. college to go carbon neutral. Oberlin is has a “living machine,” which processes waste water through a plant- and bacteria-based filtration system. UCLA has already increased bicycle use by an encouraging 50 percent. UC Berkeley, well known for its passionate progressive spirit, has won national attention for hosting the first certified organic kitchen in a college setting. Harvard is one of the top purchasers of renewable energy. In 2007, Duke University opened the SmartHouse dormitory, a LEED platinum building. Rider University is among the ranks of colleges striving to do their part. Like Duke, Rider has also constructed a LEED (Leadership in Energy and Environmental Design) dormitory–one of the recent large-scale projects. For an overview on LEED certification, go here. Many more projects are in the works, so keep visiting us as the school year begins to keep up-to-date. I have started to plan for the Fall Earth Festival at Rider and decided that it would be fun to have a do-it-yourself craft booth. As I was searching for crafts made from recycled materials, I stumbled upon this little gem. I don’t know what to say. Reminds me a little of the misfit toys from Toy Story. 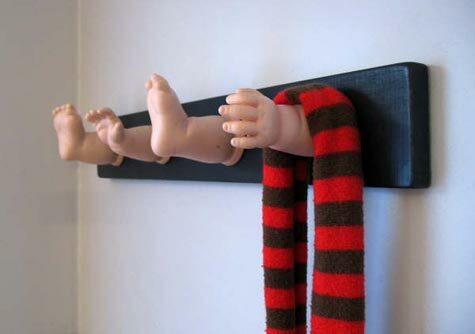 for those of you who are curious (and slightly odd), learn how to make a “baby doll coat rack” of your very own here. and props to the creator, who certainly used her imagination to reuse something that would otherwise be discarded! Our mission is to build a worldwide gifting movement that reduces waste, saves precious resources, and eases the burden on our landfills while enabling our members to benefit from the strength of a larger community. Check out this great opportunity to reduce and reuse. As a member (it’s free to join), you can post offers, wants, curb alerts, etc. to people in your immediate community. For those of you who live in the Princeton area, here are the links for Freecycle Princeton and Mercer County Freecycle. Snakey shame [read like Sean Connery]. 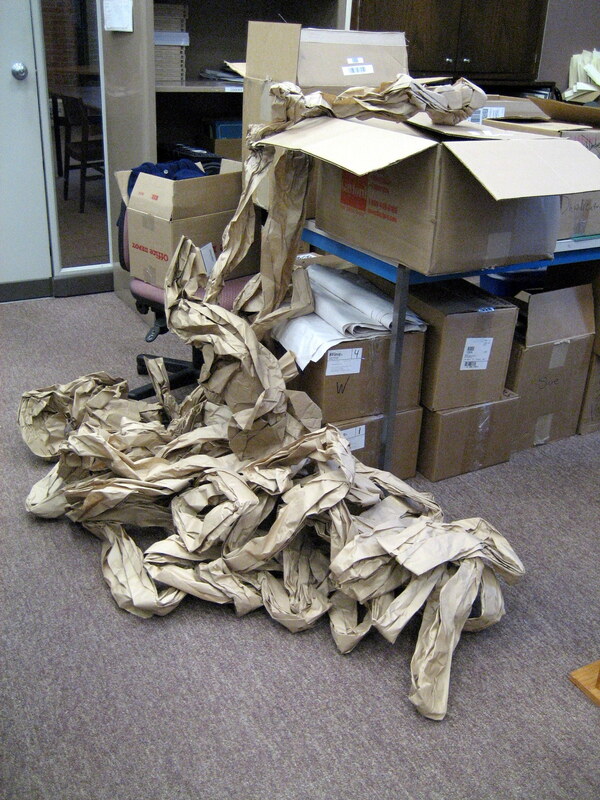 Either an anaconda shed its skin, or the manufacturers used waaaaaaaaaay too much packing paper…. It should be embarrassing for a company, especially in this day and age, to waste such an excessive amount of material. The products being delivered are not fragile and certainly do not require that amount of extra packaging. It took multiple recycling bins to house all of that excess. This free service is the first such offering made so widely available by a retailer in the United States and offers customers additional options for making environmentally conscious decisions from purchase to disposal…In any Home Depot store, customers can simply bring in any expired, unbroken CFL bulbs, and give them to the store associate behind the returns desk. The bulbs will then be managed responsibly by an environmental management company who will coordinate CFL packaging, transportation, and recycling to maximize safety and ensure environmental compliance. I heart you, Home Depot, and so does the environment.